Wedding Invitations set the tone for your entire event. Many couples like the old world look of the wax seal on their wedding invitations, especially for weddings in New Orleans, where the history is such a prominent detail in the wedding theme. Your invitation sets your tone for your entire event, so if you want to make a big statement, a wax seal is a great detail to add. Unfortunately there are some negatives to using them. The first is that they aren’t a quick process. Each one takes about 15 seconds to do. The second is that they cost more to mail. Because the post office can’t send an envelope with a wax seal through the mail sorter machine, they have to hand-sort them. That additional effort could cost you up to a dollar or more per envelope, so keep that in mind when you’re making the choice to use or not to use a wax seal. If you decide the look is worth the time and expense, here is a short video on how to make the seal look like it was done by a pro! Want help on your wedding invitations and planning from a professional? Contact us to get a quote. Day-of, Consultation and Management, and Full Service Packages are available, as well as a la carte services like Second Line Planning and Hotel Welcome Gifts! To Tip or Not to Tip…. That’s every bride’s question. 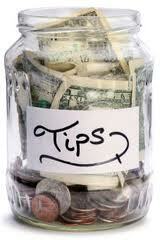 There are lots of articles out there explaining who you should tip and who you shouldn’t tip. At the end of the day, it comes down to this: if you would tip that person when its not your wedding day, you should tip them when it is your wedding day. If you feel like someone went out of their way or went above and beyond, tip. Tips should be 10-20%, just like when you tip at a restaurant, based on the performance of the person giving the service. Tips are best in cash, but if that’s not possible, you can add it to a payment by check. Have tips and payments ready in advance, in sealed, labeled envelopes that will be easy to hand out day-of. If you have a wedding coordinator, you can give these envelopes to him or her at the rehearsal and check that off of your list. If you have more advice or questions about tipping, please comment!